Sonny Bashore is well known for carving spearing fish decoys, jig sticks and waterfowl decoys. He won the Indiana Duck Stamp competition and has created many waterfowl paintings. His decoys, both fish and waterfowl, have been seen in collections around the country. His world-class carvings, as rule, are sold out in hours after he arrives at the show. Sonny retired from the Ohio Department of Wildlife after serving 20 years. He hunts and fishes during the season, but spends his time in his carving shed. He is known for his ability to repaint and reproduce the Mason decoys of the past. 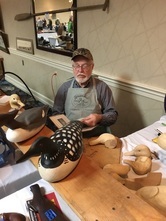 Paul Busick was the first to present a decoy carving event for the ODCCA and served as Executive Vice President. He was and still is a strong supporter for rules to govern the judging on decoys. During many events he would show carvers and others his ability to use a carving knife. Even today he can be seen doing what he knows best - making decoys. He was the first to help organize the International Waterfowl Carvers Association in rule making. Much of what he contributed still stands. Gene and Linda Kangas were among the early founding members of the ODCCA. Their early newsletters to the members were well-written and presented valuable history to the decoy world. Their efforts throughout the years have contributed in many ways to the continued success of the organization. Gene designed the original logo and did a remake of the current logo. He also has written many books on collecting. He continues to write well-researched articles for national publications. He is a noted sculptor and college professor.